Attention mortgage shoppers: Important new rules are taking effect soon that will protect consumers from risky mortgages and help borrowers better manage a home loan. The rules from the Consumer Financial Protection Bureau (CFPB), which will implement provisions of the 2010 Dodd-Frank financial reform law, address concerns about the mortgage lending process that resulted in some borrowers facing payment problems and home foreclosures in the recent financial crisis. In particular, the new rules are meant to ensure that consumers are not encouraged by a lender or loan broker to take a mortgage that they dont have the ability to repay. Other provisions in the rules will help consumers do a better job of protecting themselves. The CFPBs mortgage-related rulemakings will set the stage for the mortgage-lending process in the future, said Jonathan Miller, Deputy Director in the FDICs Division of Depositor and Consumer Protection. FDIC Consumer News previously reported on some of the coming changes, but here is a closer look at the new rules plus practical tips for mortgage shoppers and borrowers. One rule governs the compensation of loan originators  including loan officers and mortgage brokers  to promote responsible behavior by these professionals. Financial institutions and other organizations also will be required to ensure that their loan originators are licensed or registered under existing state or federal laws. 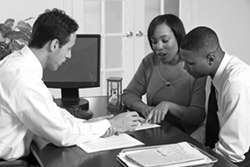 For loan originators who are not required to be licensed and are not licensed, employers must obtain criminal background checks from a law enforcement agency, get a credit report, and check for other information about possible misconduct (such as civil lawsuits involving fraud).Employers also must provide periodic training to such loan originators to make sure they understand the legal protections and requirements that apply to loans they originate. The loan originator compensation rule also includes a prohibition on financing credit insurance in connection with any residential mortgage loan, and a requirement that the loan originator’s name and unique “identifier” be provided on certain loan documents. An escrow account is commonly set up when a borrower gets a mortgage. And, it is funded by money from the loan payment. The mortgage servicer  the company that collects a borrowers mortgage payments and otherwise helps manage a lenders home loans  will use money in the account to pay for items such as real estate taxes and homeowner (hazard) insurance. Under the CFPB rule that became effective on June 1, 2013, certain lenders must establish an escrow account for a borrower of a higher-priced mortgage loan (one that exceeds a specified Annual Percentage Rate or APR) for at least five years, up from one year under previous regulations. The new escrow rule is intended to make sure that borrowers can meet their ongoing mortgage-related expenses, including taxes and insurance, said Gimble. The rule applies to higher-priced mortgage loans secured by a first lien on a principal dwelling (i.e., these are not home-equity type second mortgages or loans secured by vacation or other second homes). After five years, the borrower could request that the escrow account be cancelled under certain circumstances, though most borrowers typically retain escrows for the life of the loan. New underwriting standards have been added that, for most mortgages, generally require lenders to make a reasonable and good-faith determination that an applicant has a reasonable ability to repay the loan. This rule outlines several factors that lenders must consider before approving a mortgage, such as the consumers income or assets, employment, and other ongoing debt obligations such as child-support payments. Loan applicants also will have to supply financial information and lenders will have to verify it. The new underwriting standards are designed to protect consumers from certain risky loan features that allow borrowers to take out mortgages they cannot afford. These loans include those with payments that start low but go up significantly in the future, perhaps to levels beyond what the borrower can afford. Examples are loans that can have periods when the borrower only pays the interest due or less than the interest due. The latter can result in negative amortization, where the amount you owe actually increases over time. This CFPBs mortgage servicing rules are intended, in part, to give borrowers more information from their mortgage servicer, especially if they are having problems making loan payments. Among other things, consumers with adjustable-rate mortgages will receive earlier advance notice of changes in their loan payments when the interest rate changes. And, certain loan servicers will be required to provide borrowers who are behind on their payments with a written notice of their options for avoiding foreclosure, if appropriate. Practical Tip: Watch for communications from your mortgage servicer in order to remain informed about important dates or response deadlines associated with your loan. Also, for borrowers having trouble paying their mortgage, the CFPB provides information at www.consumerfinance.gov/mortgagehelp. Because these loans are typically offered to consumers with relatively low credit scores, lenders tend to view these applicants as riskier candidates for a loan. To protect consumers before they agree to this type of high-cost mortgage, the new rule will require the lender to disclose certain cost information. Additionally, high-cost mortgages cannot contain certain loan features that are considered abusive, such as prepayment penalties. A borrower also must receive homeownership counseling before receiving a high-cost mortgage. Some loans that are not considered to have the same risk of abuse  such as loans originated by a government housing finance agency  are not covered by the rule. One provision of the new rule that is unrelated to high-cost mortgages will require homeownership counseling for first-time homebuyers who are considering a loan that allows for negative amortization. And, the rule mandates that every applicant for a mortgage receive a list of homeownership counseling organizations within three days of applying for a mortgage loan. In particular, the new rules are meant to ensure that consumers are not encouraged by a lender or loan broker to take a mortgage that they dont have the ability to repay. For more information about the new rules, visit the CFPB website at www.consumerfinance.gov and search by topic. If you have a question about the new rules, you may send an e-mail to CFPB_reginquiries@cfpb.gov or call 1-202-435-7700. For more information on buying a home, visit www.mymoney.gov.